As a ghost, Elizabeth is symbiotically linked to her supervisor, Murphy – creator of the Ghost Protocol, which forbids him to acknowledge or interact with her. Confused and alone – oppressed by her ghost status and tormented by forbidden love - Elizabeth works to unlock the secrets of her own existence. GHOST PLANET has a nice crisp, clean-looking cover. In going with a green tone, a lake, and a forest skyline, this cover helps convey the planetary romance nature of the plot. The sci-fi elements are subtle, almost contemporary/near-future in nature. The story involves a mystery and the cover promises one. I can usually resist the charms of models on covers because I know they are just that—models. However, I must admit that the one representing hero Murphy is lookin’ pretty good. Something about his piercing blue eyes…or that contemplative expression! I can see this cover appealing to many romance readers because of the hero’s handsome face and dominant placement in the design. The bright spot on his cheek especially draws the eye upward. Since the book is from Tor, the book will probably have “SF” on the spine. I imagine this cover might entice a few readers to cross the aisle from romance to science fiction. Designing the heroine as a reflection gives it a haunting feel (pun intended!). The blurb seems to indicate she plays a strong role in the plot. One part of me is like, hmm, because of that it would have been nice to have her displayed more prominently on the cover, but a) I’m probably in the minority on that and b) she *is* a spirit and the reflection in the water element does represent that aspect nicely. Let’s discover more about the GHOST PLANET cover, shall we? Sharon Lynn Fisher came aboard to share her experiences during the creation of the cover. In honor of this interview, Chef has prepared a delectable salad bar straight from his own organic farm on Fortuna Prime. Toppings range from the fresh and fruity to the sweet and savory. So dig in and read on! The Galaxy Express: Thank you so much for this cover exclusive. Were you involved in the cover process in any way? Sharon Lynn Fisher: Thank YOU for the opportunity to show it off! Yes, Tor was great – I was involved at multiple points in the process. My editor solicited my input for a cover concepts document (like a creative brief) for the designers. That included plot summary, world description, character descriptions, and comparable covers. She worked with the design team on the initial comps, and when she felt like it was getting close, she sent it my way for feedback. My agent and I both loved the concept and overall design. We made a few suggestions, and all were incorporated. We were very happy with the end result! I also was involved in writing the cover copy, and my editor and I brainstormed and came up with the tagline. TGE: Did you learn anything interesting about the creation of book covers? SLF: I'd really never thought about all the different components. Besides the art and byline, there's back cover copy, inside cover copy, a tagline, and quotes from other authors. I talked a bit about the cover quote process in a recent Spacefreighters Lounge post—that part was interesting to me, as I'd always wondered how authors got those. TGE: What were some of the thoughts that went through your mind as you waited for the cover to be made? SLF: It probably goes without saying that it is VERY exciting waiting for your cover – waiting to see a visual representation of something you've lived and breathed for at least a year, often (as in this case) much longer. The main thing is you HOPE HOPE HOPE you get a cover that feels true to your book. And you also hope that if there are elements you don't like, your feedback will be taken into consideration. I feel very lucky! TGE: Covers are important in shaping reader expectation. 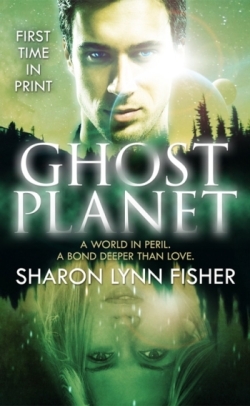 What do you hope readers will take away from the cover of GHOST PLANET? Fun stuff! Thanks again to Sharon Lynn Fisher and Tor. So, dear passengers, what are your thoughts about this cover?